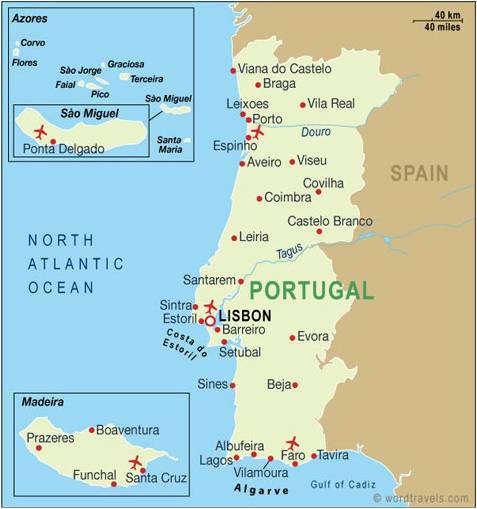 I’m leaving on Friday evening, November 1, for thirteen days in Portugal and the Azores. I’ll be traveling with 10 friends and fellow adventurers on a tour managed by Collette Vacations. In the past, I would keep in touch with family, friends and other fellow travelers by e-mail. I thought that I’d try something new this time by creating a travel blog that I plan to update daily along the route (when I have access to the internet). This is the first of the Portugal trip blog entries, being sent to test the new blog and to give you an opportunity to follow our journey through central Portugal and two of its neighboring islands. On Friday at 2:30 in the afternoon we will all gather at my home in Vincentown, where we will board a shuttle to Philadelphia International Airport for our 6:45 p.m. Luftansa flight. Our overnight flight lands at Frankfurt, Germany at 7:45 a.m, and then we take a plane to Lisbon, arriving at 11:15 a.m. Traveling with me are Tami Kessler and Rita Wood, who are leaving a day early, on October 31 to get a jump on jet lag. Flying with me are Janet Aaronson and Penny Lovenduski, Fran Daily and Janet Mee, Hans Rottau, Fred Horner and Gus Haines. We’ve all traveled together on multiple occasions. My wife, Penny, has opted out of this trip, and I will definitely miss having her with us. Lisbon, St. Michael (Azores) and Madeira. The first third of our tour takes place in and around Lisbon and the Estoril Coast of Portugal, which is more or less the west-central part of the country and consists of a 3-night stay at a 5-star hotel in Lisbon. Saturday afternoon is relatively free, and then we attend a welcome dinner where we get to meet the rest of our touring party (about 30 other people from around the USA and Canada). On Sunday, Nov. 3, we tour the highlights of Lisbon and travel north along the coast to Sintra, Cascais, and Estoril. On Monday, Nov. 4, we head north again to the shrine of Fatima, Nazare, and Obidos. You may have seen the record-breaking surfer on TV earlier this week – that huge storm wave he navigated came to shore at Nazare where we will be on Monday. We fly from Lisbon on Tuesday morning, Nov. 4, north-west over the Atlantic to the largest of the Azore Islands, St. Michael, where we will stay for the next four days. On Thursday, Nov. 7, some of us will go whale and dolphin watching. We fly out of the Azores on Saturday, Nov. 9, headed due south over the Atlantic to the Island of Madeira — boasting of a subtropical climate and nicknamed the “Pearl of the Atlantic.” We explore this bit of paradise for the next three days, flying back to Lisbon on Tuesday, November 12, for our last full day and overnight in Portugal, returning home on Wednesday, November 13. You can follow this tour independently if you log into this blog at your leisure: http://www.joestravelogue.wordpress.com or find my posts on Facebook. You can selectively accept or ignore my emails as they are sent. Have a Happy Halloween!